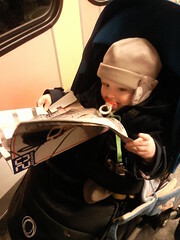 My little commuter... - Time for a nice cup of tea? It's never too early to learn the importance of a comfortable commute. He will have a shock if we ever return to London. Commuting in Zurich is very civilised by comparison!